JumpSport iBounce Kids Trampoline Review AND Giveaway!!! 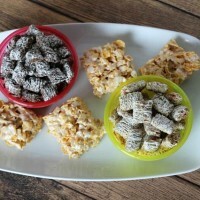 If you have toddlers in your house then you know they are packed full of energy every day. With 3 kids age 4 and under I can attest to that! We love to go outside and play however that isn’t always possible. 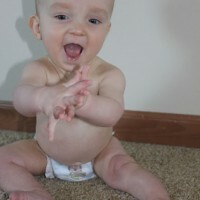 Sometimes the weather isn’t great outside or I have to stay inside to get things done or watch our baby. How do we provide a way for our kids to get the exercise they need and burn off some of that energy while being stuck indoors? I especially deal with this issue in the Winter but rainy days also present this issue. In search of a way to help my kids burn off some energy I found the iBounce Kids Trampoline. The brand new iBounce™ Kids Trampoline from JumpSport® is a high-quality indoor trampoline that comes with a video adventure featuring the spunky RompyRoo™ cartoon character. Kids hop along with RompyRoo as they learn basic movement skills and counting concepts. Play the video on an iPad or tablet using the included tablet mount, or pop the included DVD into a DVD player. 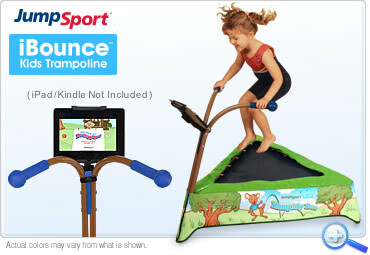 JumpSport will release a new bounce-along title every few months to keep the exercise fresh for kids. We opted to play the included DVD instead of using the tablet mount. The kids loved the trampoline from the moment we set it up and after spending a week just jumping and playing on it NON STOP we decided to give the video a try too. Boy did they love it! Even at 2 years old Aiden was able to follow along with the video and have fun. He loved jumping along to it! Jumping without the video was also just as fun for my kids but the video adds a whole new element to the fun on the trampoline. The day we got the iBounce trampoline we had 2 other kids over that are the same ages as Danika and Aiden. The trampoline was such a hit that for the entire play date (several hours) they all took turns jumping on the trampoline. They didn’t venture past the living room and weren’t interested in playing with anything else. When they left the little girl asked her Mom if they could go home and buy one because it was so much fun. 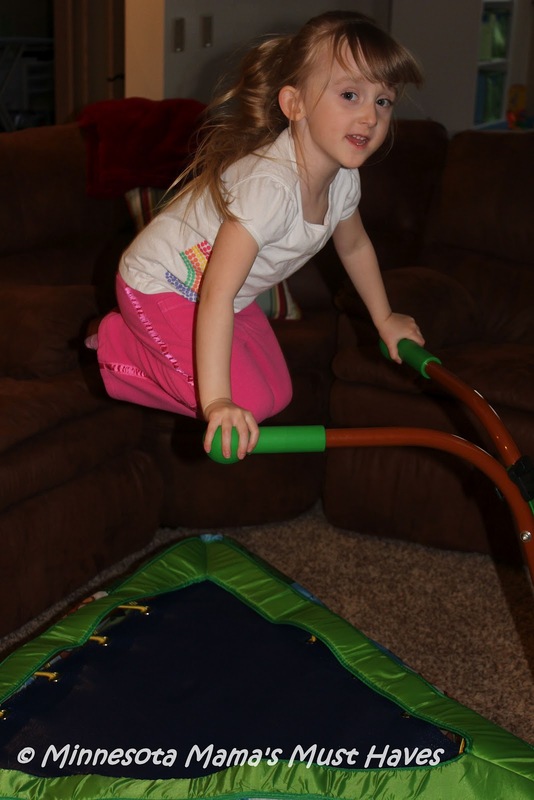 Danika has had a blast learning different moves and jumps on the trampoline. The handlebars are perfect for helping little ones learn balance and coordination while feeling stable. 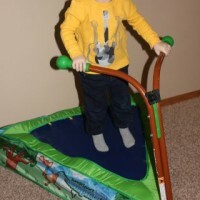 The bungee cords provide a soft and lively bounce so it isn’t stiff at all and gives just enough when they jump. Danika has now even mastered a tuck jump, lifting her legs up to her bum. Without the handlebars she wouldn’t have been able to learn this so easily. If you have an iPad or tablet then you can also use the included tablet mount and download the RompyRoo adventure on your tablet. Kids can then follow along with RompyRoo on his many adventures. It is a great way to encourage kids to get the exercise they need and burn off some of that bottled up energy! There is nothing like seeing the product in action so here is a great demo by Aiden and Danika which will show you what you can do on the iBounce. Would you like a shot at winning one of these awesome iBounce kids trampolines??? Enter my Rafflecopter giveaway below!! Good Luck! 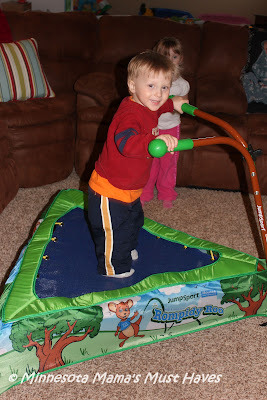 Beat The Winter Blues With The JumpSport Kids Trampoline and Hop-A-Long with RompyRoo! « I See Me! “My Very Happy Birthday” Personalized Board Book Review + Giveaway + $5 Off Coupon!! I love that it made of a Durable steel frame so it will last a long time!I also love that it's Compatible with iPad, all Kindles (DX Landscape only), Nooks, and more. This is way cool! I like that it has a user weight limit of 80 lbs so my GD, GS and nephew all 3 can use it. I like that it has handles. I like that it only weighs 13.5 lbs. I learned it is easily assembled in as little as 15 minutes! i love the tablet mount! I like that you can attach your ipad and that there are multiple options of shows available for your child! 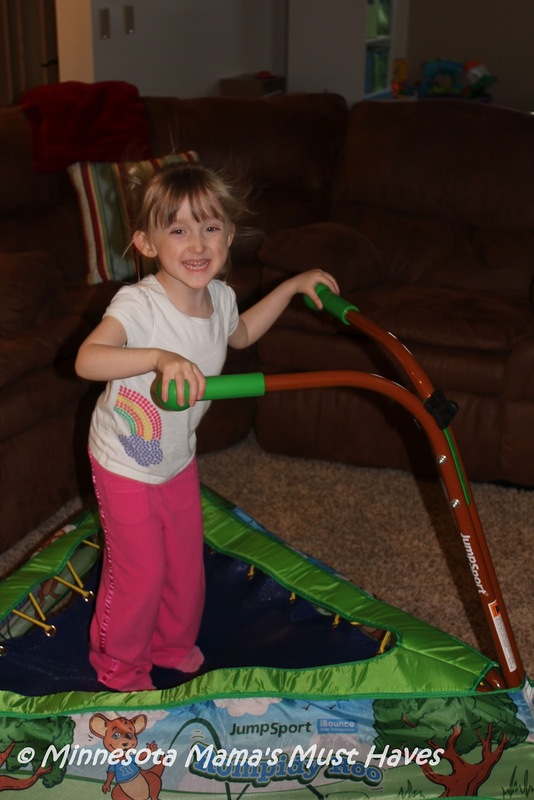 I love that the iBounce can provide exercise for children when it's too cold to play outside! I love the handles! My grandson will definitely need those! I love that they use safety measure! NO springs and handles for the kids to hold on to! It's nice that it has handles and the great thing is it gets kids up and moving! and looks like so much fun. I love that it is good for 2 to 5 yr olds. My daughter would love this and she jsut turned 2 so it is perfect. I absolutely love the safety aspect! We really appreciate that! I love that this trampoline is a great way for toddlers to get exercise. I love the way it uses bungees instead of springs. I love the size, that it would keep kids active when stuck inside! I also love the handle bars for added stability! For me what I love most is the quick set up! 15 minutes sounds pretty easy. I just like the idea of having something new and fun, plus gives kids a chance to exercise maybe while watching tv! I like the handles too, since it makes it pretty safe to jump n hold on too! I love that you can attach a tablet to it so they can learn at the same time! My girls would love this! i love that this is ipod compatible! I love that you can secure a tablet to the iBounce. I love that it supports active play, safely, indoors! I like that it holds up to 80 pounds. I love that it's a safe indoor activity that teaches children motor skills. I like that it is easy to assemble and can hold a tablet. I love that this is geared towards younger kiddos with the safety bar! I really like the ipad attachement, very cool! I like the ipad feature. I like that it's a great way for kids to get exercise on inside days! I love that the iBounce includes a DVD so my daughters can have some structured playtime as well as free play. I love the weight limit: 80lbs! What don't I love! The 80 lb weight limit is great so both my girls could use it. i like the handles thats safe! The handles would really ease my mind since my daughter is the one who will be using it mostly. I like that it has a Tablet Mount since my kids enjoy their tablets. love that it keeps the kids active…great when it's raining and they can still burn off some energy inside! I love that it's safe for toddlers and develops coordination. I love that it's good for indoor use on not so nice days! I love that it has a decent weight limit and an ipad holder! 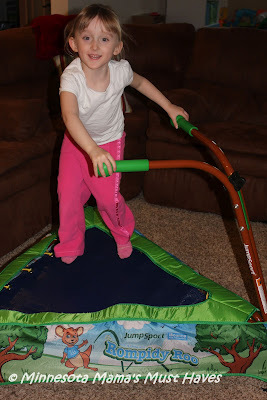 fun and engaging way for toddlers to exercise! I like the size. It's perfect for one so that my son can exert energy without getting hurt by other kids. I like that it has a durable steel frame and quick easy installation. Thanks. I like that it has handles. I also like that it's a great way for them to exercise inside. I like that it is compatible with my Nook Tablet or my husband's kindle. It would be a great thing to help build my daughter's coordination. She's a little klutzy! user weight limit is 80 lbs! I love the feature of the Durable steel frame! Some I have seen seem so unstable. This looks like a GREAT stable one! I love that it is so easy to assemble. I liked the padded handles… good idea! I love the tablet mount. My kids enjoy using their tablets. I love that it helps to develop coordination, balance and endurance. It has a tablet mount. I like that it can be set up in less than 15 minutes and that it can go up to 80 lbs. so my son can use it for many years! Great way to keep kids active especially during winter! Love that my son can still be active and run off his enery inside when its to late or rainy outside so cool!!!!! I love that it has handles! I like that it's easy to assemble. I love how compact it is and my three year old can use it. We don't get much outdoor time with our long winters and this would be perfect! I love that it only weighs 13.5 lbs and can be both fun and gives the kids excersize at the same time! !